It’s Colts football season and that means that it’s tailgating season! Just like last year, the Colts and Indiana Pork have partnered in search of the best pork tailgate recipe in all of Colts Nation, and guess who is in charge of it? Yours truly! We’re going to be searching for the best pork tailgate recipes you have to offer. We want to see some creativity and of course plenty of pork! What something to sweeten the deal? How about a year supply of bacon! Yes, the grand prize winner will receive a year supply of bacon. The weekly winners will receive a prize package consisting of a $50 Meijer gift certificate,101 Things to Do With Bacon Book, Indiana Pork Apron, Colts hat, Colts yearbook and Colts 2013 Season DVD. We’ve had a lot of GREAT recipes this year but this is the final week for the contest! Sad, but true. 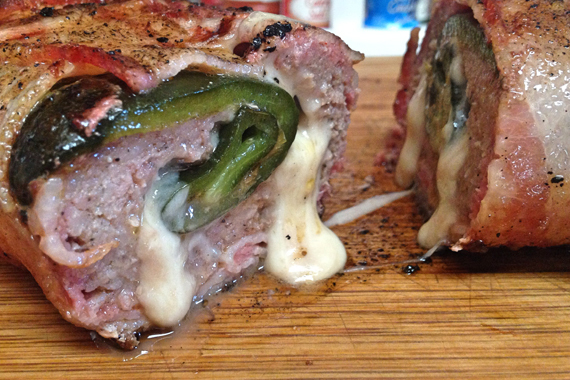 This week’s winning recipe comes from Mike C. of Cache, Oklahoma who takes the “fatty” phenomenon to a whole new level. This spicy rendition of a pork-topia looks like a great way to spend a cold December Sunday! Start by roasting your chiles over fire or high heat until they blister. Place the chiles in a ziplock bag for 10 minutes so they can steam. Once they’ve steamed a while, remove the skin then open the chiles to remove the seeds. Make a weave with your bacon and set aside. Spread your pork into a rectangle shape on plastic wrap or wax paper. Place your two skinned and seeded chiles down on the middle of the pork sausage then top the chiles with your cheese. Using the plastic wrap or wax paper, roll the sausage, chiles and cheese up into a log, then place the log on the bacon weave. Wrap the bacon weave around the roll and you’re ready to grill or bake. Medium heat on the grill (or 400 degree oven) for 10 minutes, then flip and finish on the other side for an additional 15. As if your imagination isn’t enough, Mike provided a visual to go along with this beast. Dig in! Thanks for all the 2014 entries and recipe winners. We will have details on the Grand Prize winner here soon!